On the hillside of a Humboldt vineyard, in what was once a barn in the land’s historic farm days, is the Companion Gallery, where local ceramicist Eric Botbyl has his studio as well as a gallery shop featuring work by fellow potters from around the country. It’s a quiet place where the doors are left open to catch the breeze on spring days like today and is kept warm by a wood-burning stove in the winter. It’s surrounded by twenty-two acres of grapevines and neighbors the Crown Winery’s Tuscan-style villa. “I try not to ever make the same cup twice,” Eric says, “but I do like to work in a series. For the longest time my work was really symmetrical and was based off of a square cup or something six-sided, and I just realized that working asymmetrically was a kind of deficiency I had. So about a year ago I gave myself kind of a challenge to start working more asymmetrically. . . .” Sitting at his wheel with a perfectly smooth and symmetrical vase, he pinches the neck and bends it a little to give the vase’s opening a quirky, asymmetrical tilt. This year marks Eric’s twentieth year working in ceramics. He discovered the discipline as a student at Union University and has been at it since. After he graduated, Morris Nursery hired him as a potter and provided him with his first studio, allowing him to grow in his craft and to begin teaching lessons. Today you’ll find him at the Companion Gallery, which opened in 2008, where you can take classes, browse the shop, and discover new potters through his curated shows. “Where do you find inspiration for your work?” I ask. “That’s a tricky question,” he tells me. “I’m not trying to create imagery. It’s not like I’m inspired by this sunset, and I’m going to make a glaze like a sunset. . . I have things that catch my eye, and then I think I just tuck them away in the back of my mind and just work all the time. It seems like paying attention to your own life and working all the time, those things just come out. 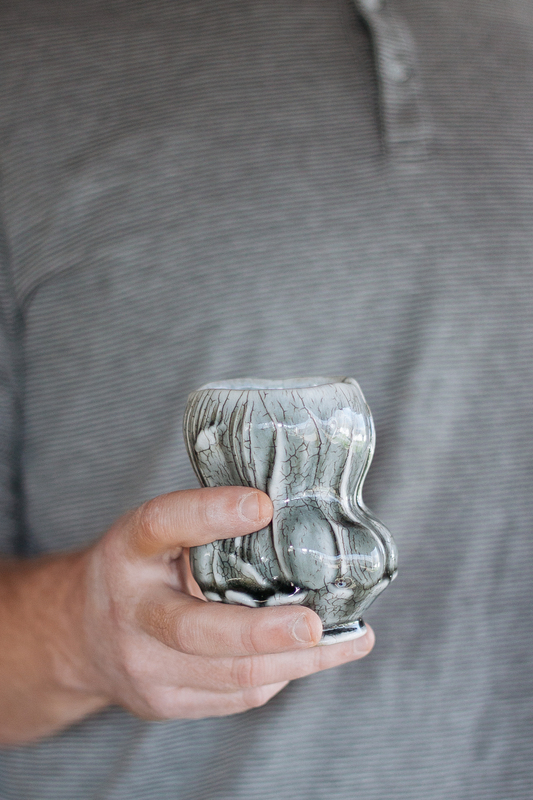 Eric’s work, which ranges from mugs to pitchers to baskets and bowls, exudes a sort of organic quality. He utilizes a range of earth tones, sometimes using cool, stony colors or making wide, sea-colored bowls that remind me of stirring tide pools or mugs whose clay nature is so evident in their rich browns and reds that you just know you’re holding something that came from the earth. Eric works on a couple of pieces that are in progress as we talk, bringing new form to mugs that have been drying but whose clay is still soft enough to manipulate. His hands work at an unhurried pace, taking as much time with the clay as he seems to take with his words, speaking gently and carefully about his art. He presses outward from inside the mug giving a new, fuller shape to the clay, and carves away at its exterior to give it a wavy texture. “Texture is something that I’m always drawn to,” he says. “So I make my own stamps.” He shows me square clay blocks that he’s made, having carved intricate grooves and patterns into them so that each imprint connects with itself to make broader panels of texture. He shows me other molds he’s made of zippers and Christmas lights and barbed wire and barn wood that add a more three-dimensional quality to his pieces. “You talked about the nature of clay and how it’s almost eternal. Do you feel like working with clay has shaped your understanding of the earth?” I ask him. 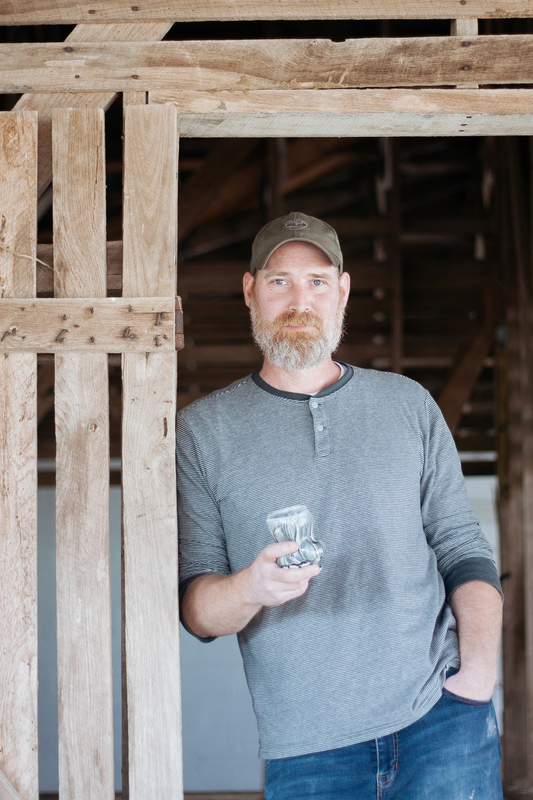 It’s interesting to watch Eric interacting with clay and pottery as a maker, but I realize as we’re speaking that he has an equally rich experience with ceramics as a user. He takes a coffee mug, made by another potter, that he’s been drinking out of from the shelf and holds it out to show me its narrative. He shows me how he knows it was fired in a wood kiln, the three marks on the side where the piece was fired sitting on top of seashells, the horizontal lines wrapped around the mug’s body marking the path of the ash glaze, and the round jewel where that ash collected and cooled on the lip of the mug. It’s an experience, he says, that you can’t get from the sterile, cylindrical mugs printed with phrases like I LOVE NY or WORLD’S BEST BOSS. There’s a magnetism in Eric’s speech as he chronicles the intermingling of story and element and the passage from earth to maker to user. It infuses a sort of mysticism into the ordinariness of our morning coffee, knowing that the vessel you may be drinking from has traveled such a long journey before finding a place of rest in your hands. You can find the Companion Gallery at 3638 East Mitchell Street in Humboldt, Tennessee. To learn more about Eric’s work, the gallery, weekly classes, or kids’ summer camp, call 731.267.7784 or visit their website and Facebook page.